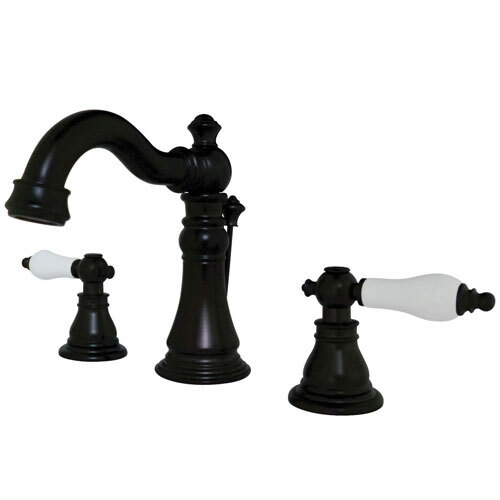 Kingston Oil Rubbed Bronze 2 Handle 8-inch Widespread Bathroom Faucet FS1975APL: This Two Handle 8-inch Widespread Bathroom Faucet w Drain is built to last. The highest quality standards are used to precision manufacturer a top of the line product. Important features of this BRAND NEW Fixture: Complete Item! Everything necessary for installation is included. - White Porcelain Lever Handle - Matching Accessories Available - Easy to Install - Installation instructions included - Two Handle 8-inch Widespread Bathroom Faucet with Pop-up - Matching pop-up drain included - Designed for a lifetime of performance - Meets ASME A112.18.1, ANSI/NSF 61 Sec. 9 code - All mounting hardware included - A 10-year limited warranty is provided to the original consumer. - Oil Rubbed Bronze premier finish designed to resist fading and tarnishing. This fixture is manufactured by Kingston Brass and is part of their American Patriot collection.